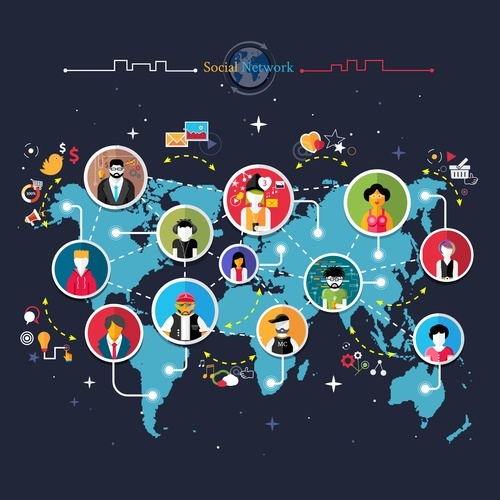 Building strong social media connections should be an essential part of any marketer’s or businesses’ digital marketing strategy, and some of the most important connections are with social media influencers. In this blog post, I will be exploring the importance of social media influencers, where you can find them and how you can connect with them. Influencers are social media users that have a strong following in your niche and have the power to influence the buying decision of their followers – they can help with shares and engagement on social media, writing reviews about your service or product, or simply by being thought leaders in your industry. So the question here is, who in your niche has the power to influence their followers to potentially buy your product or service? As I mentioned in the introduction, social media influencers should be a part of any digital marketing strategy, as they can be of huge help to your business. People are more likely to trust an influencer that they’ve been following for some time and who has always given them sound information, rather than advertising. Helping you reach a bigger audience online and spreading the word about your business: a true influencer will have a following base that trusts their opinion, so hearing about your brand from them can be very beneficial to your success. Reviewing your product/service on their blog: a review on their blog could reach a large group of readers and massively increase your reach, as well as your sales numbers. Helping you get more engagement on social media: just a share from a social media influencer can get you tons of engagement, such as retweets, likes and comments. Helping you to provide better content for your audience: once you identify an influencer, look at the type of content they usually share and what types of results they get. This way, you find out what kind of content is relevant to your audience and what you can do to improve your content marketing strategies. Another important aspect when it comes to connecting with social media influencers is that it doesn’t cost you anything to create and grow this relationship; or, at the very least, it’s much cheaper than ads and other paid promotions. All you need is time, patience and maybe a tool to help you identify influencers – the rest is just engagement. How do you know if a social media influencer is right for you? To figure out if a social media influencer is a right choice for you, you need to look at two main things: the type of content they provide and share and their blog traffic and social media follower numbers. Start by checking out their website and blog to see what type of content they write: are they writing the same things as you? Are they writing about products and services similar to yours? Do you share the same interests and values? Next, check to see what other content they are sharing on their blog and on social media – is the content relevant to your business and your target audience? Then, you have to look at their social media presence, meaning how many followers they have and how much their followers engage with them and the content they share. Check out their blog engagement as well: are their blog posts getting lots of shares, likes and comments? Keep in mind that engagement can be a much more relevant stat than follower numbers. A person might have 100,000 followers and yet have low engagement levels, and in cases like this one, they might actually not be much of an influencer. On the other hand, if they’re getting lots of retweets every time they post something interesting, or they get a lot of comments and questions from their followers, that shows that their audience is interested in their opinion and their updates – which makes them influencers. BuzzSumo is a tool that helps you identify the top content being written for any given topic, as well as the key influencers. It is heavily based on content insights and research, but it is also a strong tool for identifying key influencers in your niche. You can use BuzzSumo to find influencers for any topic you could think of or location and then analyse and organise them by reach, authority, influence and engagement. You will also get to see exactly what content each influencer shares, including what types of topics and domains they share. Once you’ve identified influencers, you can follow them on social media directly within the BuzzSumo tool as well as reach out to them and start engaging. 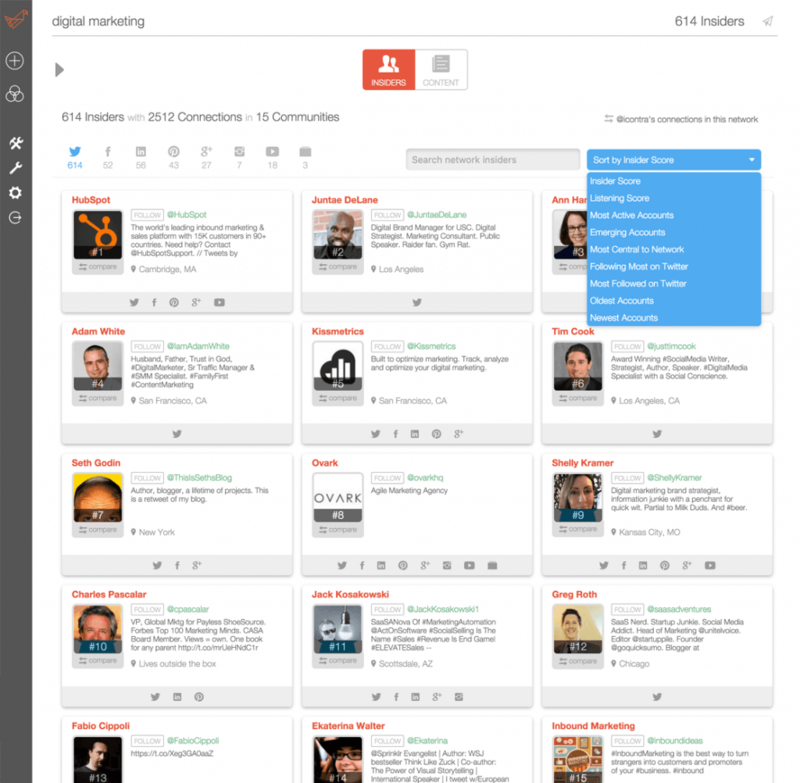 From there, you can start sorting and filtering your results to find the most relevant influencers for you. Go to Sort By to select which influencers you want to see first, such as the ones with the biggest domain authority, or the ones with the most followers or retweets. To filter your results, your main options are on the left-hand side of the screen. You can filter them by location, both by city and country, which is great for those whose business has a physical location, or those who sell products and services only in one city/country. You can also filter them by types, such as bloggers, influencers, companies, journalists and regular people. If you want to search for multiple keywords, simply write OR between them, rather than a comma. You can also use BuzzSumo to search for particular influencers by entering @ followed by their username. Once you’ve identified an influencer, you can check out the links they shared in the recent past by clicking on ‘links shared’ at the right of their name. You will be able to see a list of all of the content shared by that particular user in the recent past, and by clicking on the “other sharers” button at the end of each link, you’ll be able to see who else has shared it as well. If an influencer has caught your eye, you can easily save them in your outreach lists by clicking on “save influencer” and creating/selecting a list. 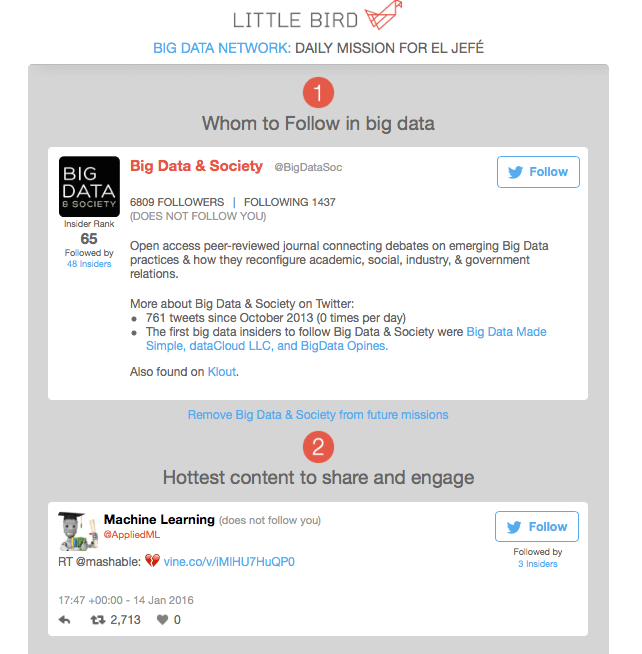 Little Bird is similar to BuzzSumo in terms of the information it provides – i.e. 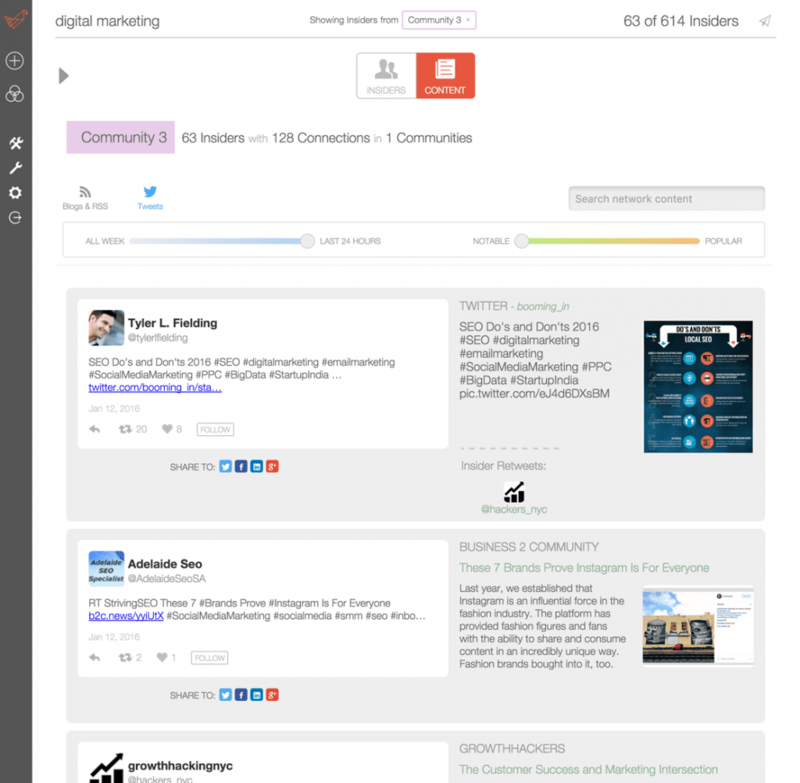 key influencers and top content shared – but it has a very different, but just as easy to use, interface. Their sorting is quite different, including the accounts’ age, insider score and listening score, and most central to network. You will be able to see how these influencers rank within a network, as well as find new, emerging influencers in your niche. This is a really great feature, as it allows you to grow along with the influencer by promoting and supporting each other. By clicking on an influencers’ profile, you will be able to see a more detailed analysis of their reach and influence with the network and niche. Another cool feature is that you get to find out if you’ve missed any opportunities for connections with those who have already connected with you via social media. Klear is mainly a monitoring and reporting tool for social media, but it also has a pretty good influencer search tool. From here, start filtering your results; for users of the free Klear version, you can only sort by type of influencer (celebrity, power users, casual, novice) and location. With the Pro version, you go much further with your searches: choose the network (Twitter, Instagram, Youtube and blogs), skills (these differ as you search for different industries) and even choose the gender you want. You can also choose to exclude some from searches, such as those with low activity and popularity, brands, and those who rarely engage. One of the things I like about Klear is that just under the name of the influencer you see how responsive they are on social media, or how often they engage with their followers and other users. Followerwonk from Moz is a Twitter analytics tool that also allows you to search for key influencers on Twitter. You can then order them by relevance, follower or following numbers, tweets, days old or social authority to explore all of the results. This is the perfect tool for small businesses that want to get their foot in the water and start exploring the key influencers in their niche in a fast, cost-free way. But for more in-depth results and for those who want to start an influencer outreach campaign, it would be more useful to invest in one of the more extensive tools, such as BuzzSumo or Little Bird. So now that you’ve found a list of social media influencers, what is the next step? How do you connect with them and start building a relationship that could be mutually beneficial? Building relationships with influencers will take time, so you have to be patient – but, it’s well worth it, as the benefits of connecting with an influencer will outweigh the time and effort you put into it. Start by following them on social media and engaging with them as often as possible to get your name out there. Share and like their content whenever they post something good and retweet their best tweets. In order to really stand out, though, you need to actively engage with them by actually talking to them on social media. If they are starting or holding a conversation on Twitter, jump in the conversation to give your input. If they are hosting a Twitter Chat, make sure you know when it’s happening and do your best to make it on time and participate. It’s also useful to check their blog regularly and leave comments on their posts, so that you engage with them on as many platforms as possible, and therefore increase your chances of being noticed by them. Mention them or their work in your own blog posts, and provide them with backlinks – this way, they are more likely to return the favour in the future. You could also take it to the ‘real’ world – for example, is an influencer attending any event in your area? It could be a conference, or a networking event, for example, and if that’s the case, there might be even more influencers attending. By attending these meetings, you’ll get to meet and network with influencers, and other interesting people that could help you in the future and give you valuable advice. The important thing is that you need to keep engaging with them as time passes, and not just start connecting and then completely forget about them after you’ve gotten some results. It’s important to keep engaging so that these relationships you’ve formed remain strong. Keeping track of several influencers and your relationship with them can be quite daunting, though. One of the ways to make sure you don’t forget about engaging with your key influencers is to add all of their blogs in your preferred RSS reader and once a day (or at least a few times a week) check out their latest blog posts, share them with your social media followers, and leave a few comments. 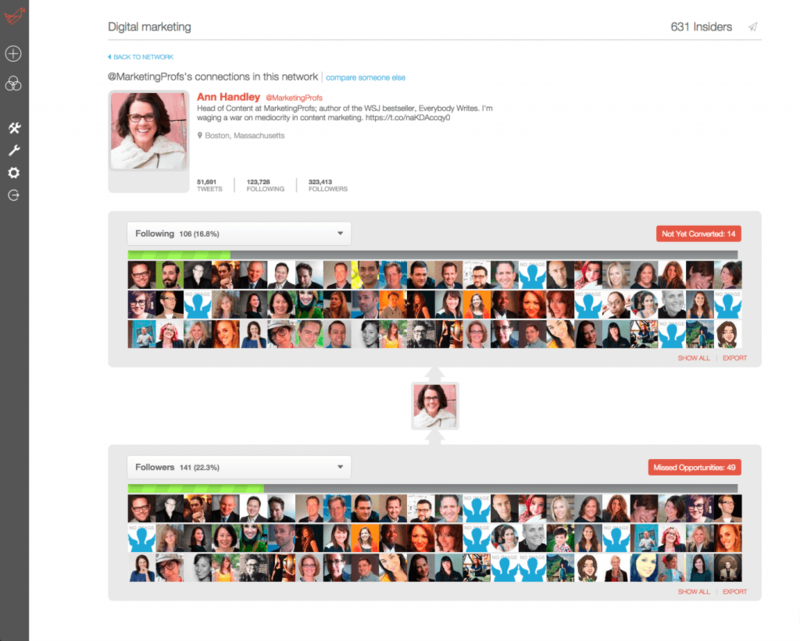 If your influencers are on Twitter, you could create a few Twitter lists with all of them. Whenever you have the time to go on Twitter, simply go to your list and start tweeting the influencers – this way, you will be able to easily keep track of all of your influencers in one place, and it makes it easier to tweet each one. Once you’ve connected with an influencer, and you feel as though you’ve created a certain rapport between you two, you can start working towards getting the results you need. As I mentioned earlier, you should try to link to their content and website whenever appropriate. In order to get them to notice and take action (unless maybe when they’re getting lots of traffic from your website), you shouldn’t be afraid to let them know about the backlink and ask them to share with their followers. Most times, especially if the content is good enough, they will share it – after all, it can also be very advantageous for them. 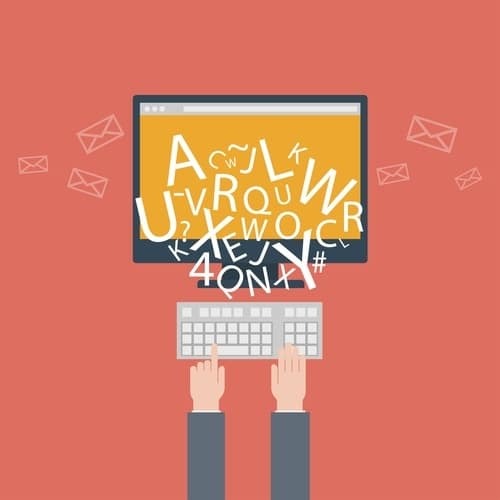 Another way of benefitting from your newly found relationship is through guest blogging. Think of an awesome topic that would fit well on their blog, and come up with a title and outline that you can propose to them. Make sure that it’s really high quality, though, as most influencers will only want the best on their website, and you will also reach a whole new, targeted audience that you want to impress enough that they will be interested to see who you are and what your business is about. You can also contact influencers to ask them if they would like to guest blog on your website. A guest blog from someone influential can get you more shares and engagement on social media and your blog and bring in some new traffic. In order to kill two birds with one stone (or even more birds, actually! ), you could write an extensive post where you ask influencers for their opinions. This is a great method as it has lots of benefits for all parties involved. 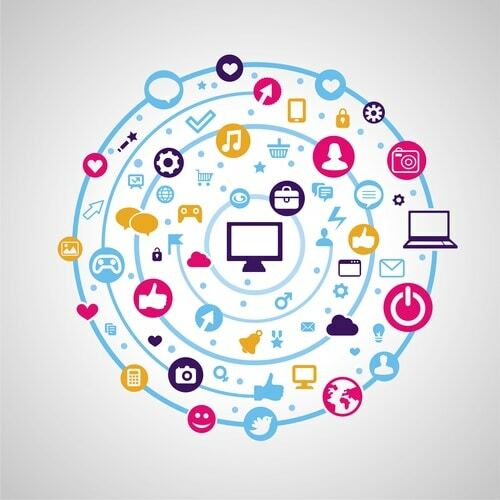 The influencers will get backlinks, shares and engagement and they only need to write a few lines or paragraphs, while you get lots of shares from some of the top social media users, a post that offers value to your readers, and the potential to get more traffic to your website and maybe even more conversions. Think of a question that you can send to all of the relevant influencers in your list and then send it via email or even social media, but make sure to send it to as many as possible so that you get as many responses as you need. Let them know that you will provide them with links to their website and anything else you want to, such as their photo, or maybe even their bio. Once the post is ready, let every influencer on the list know it’s published so that they can promote it, and make sure you also have the time to heavily promote it so that you get as much as you can out of it. Another way to benefit from your relationships with influencers is to ask them to review your product so long as you’re confident in its capabilities. Once you’ve started a relationship with an influencer, though, you have to remember that it has to be a two-way street. You can’t just have the influencer do all of this work for you while you don’t really do anything for them in return. If you need any help with identifying the right influencers for you and connecting with them, check out what I can do for you in terms of influencer outreach here. Nice article you wrote here, I really loved it. You’re absolutely right, to increase your brand awareness and get yourself out there you will need to connect with influencers on social media whose in similar niche as you and engage with them as much as possible, by doing so you will be noticed more by them and the followers and it would be great if you added some backlinks to them in a quality content as eventually they will do the same to you and end up to build a mutual beneficial relationship for both parties. Though it takes time and effort to build your brand and the relationship as well with the influencer as it doesn’t happen in a single night. My pleasure Stafania, pleased you found it useful. Hi Lilach. Thanks for sharing different tools. Currently, we use Buzzsumo. I might as well try the others that you have mentioned. Thanks Grant. 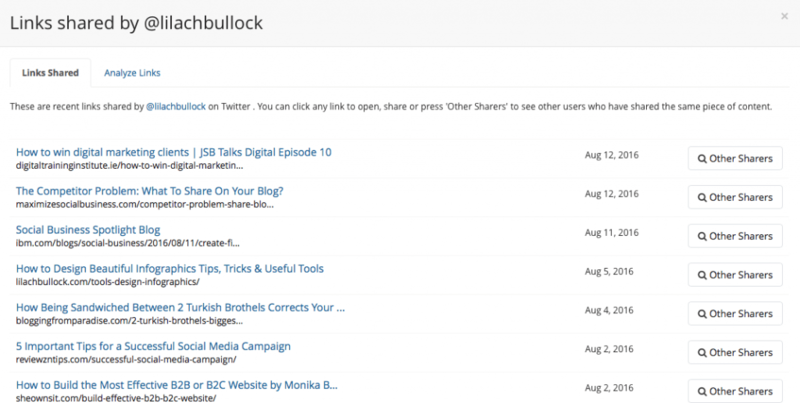 Yes Buzzsumo is a popular choice and a favourite of mine but it’s worth exploring the other tools too! Great post. I’m starting to really understand the importance of relationships in marketing! It’s a long, tough road to get to the top, which I guess is why building a relationship with someone who’s walked the same path and made it big can be so daunting. 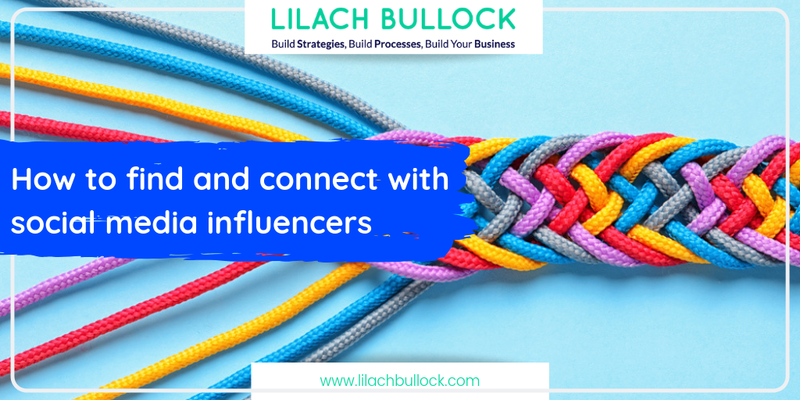 Thank you Lilach for this great summary of engaging with influencers. It is a step by step hard work but in the end you get to really reach some targeted influencers. 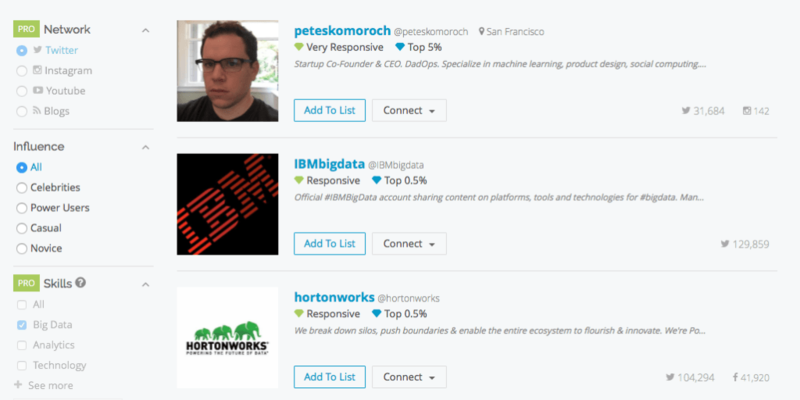 BuzzSumo is a great tool but i love using Audience for better Influencers filter. Im using Phlanx tool to find influencers, its also a good resource! Great post, I believe website owners should learn a lot from this website its really user friendly.